The major trend is up, the intermediate trend is sideways, and the near-term trend is down. 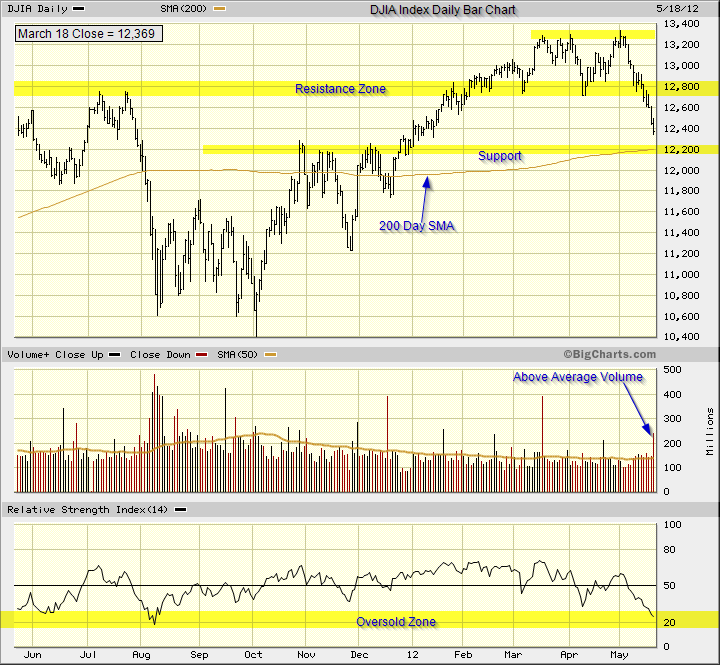 The RSI shows that the Dow is currently oversold and maybe due for a bounce. Can a bounce translate into a new near-term uptrend? The support and resistance levels are identified on the above chart. Reference the last trendline chart analysis for the DOW. Reference the chart analysis for the Dow Jones Industrial Average posted on April 6, 2012 showing the projected retracement zone. Note: This technical analysis is for educational purposes so you can learn to trade online using candlestick charts. Please conduct your own chart analysis or consult your financial advisor before making investment decisions. The chart snippets are from BigCharts.com which I recommend and have used for fifteen years. The author of this article may hold long or short positions in the featured stock or index. This entry was posted in U.S. Indexes and tagged DJIA, Technical Analysis on May 18, 2012 by Trader.